What did you want to be when you grew up? A pilot? An astronaut? An international spy? If you were anything like me, it was probably the last suggestion. Though, suffice to say, games journalism is a far cry from tactical espionage, video games still provide a great form of wish fulfillment nonetheless. And there have been loads of spy-related titles released throughout the history of the medium that allow you to live out your fantasies as a secret agent. If you’ve ever watched the cult British TV show The Prisoner, the central plot of Device 6 should be familiar to you. Waking up alone on a mysterious island with little to no recollection of how you got there, the player must solve multi-sensory puzzles to learn more about their whereabouts. Stylish, intelligent, and packed with plenty of intrigue – Device 6 is an experience that’s one in a million, proving the mobile platform has more to offer than just shallow, freemium games and inferior ports of successful PC titles. Cigarette gas spray? Check. A lipstick firearm? Check. Night vision goggles? Check. Metal Gear Solid 3 contains tons of nods to the spy genre, something that’s appropriate considering the game takes place in the 1960s during the height of the Cold War. Acting as the CIA agent “Naked Snake”, you’re unleashed into a jungle playground and given the choice of how you proceed. Use disguises and camouflage to infiltrate military outposts or knock out guards with your various devices. Just be on the lookout for gropey lightning men. They’ll see straight through your outfit. There’s more to spying than simply obtaining information and interrogating individuals. There’s also the unsavoury business of assassinations. Hitman: Blood Money is one of many games on this list that issues you a license to kill, offering you a pass to take out drug dealers, white supremacists, and corrupt CIA agents, to name but a few. It separates itself from the rest by the manner in which you get to carry out these hits: you can stage little “accidents” to occur, or execute your mark in point blank fashion. But if you’re the type of player that wants to be rewarded with the more elusive and distinguished ratings, discretion is advised. In Rare’s classic 1997 first-person shooter, players are given the golden opportunity to assume the identity of the third best 007 (behind George Lazenby and Daniel Craig obviously), as he attempts to foil a crime syndicate’s evil plan to cause a global financial meltdown. 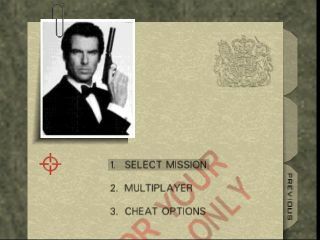 Presenting players with an impressive arsenal of weapons and gadgets, Goldeneye 007 is the most accurate and enjoyable portrayal of the famous agent in a video game to date, a fact that earns it a definite spot on this list. It also scores bonus points for its exceptional multiplayer mode, featuring other iconic characters from the film series. Life’s a riot with spy vs spy. Shunning Aston Martins and martinis, Deus Ex draws influence instead from the cyberpunk genre, pitting its central protagonist JC Denton against a group of secretive organisations, namely the Illuminati and Majestic 12. You’ll collect intel and interrogate targets, tackling situations with either stealth or guns blazing like a cold-blooded killer. And that’s not the only choice you make. Allegiances are also dependent on your actions in game, with different decisions massively altering your ending. Full of paranoia and tough decisions - Deus Ex is a fitting spy tale for the online generation. Elaborating on what they started with Goldeneye 007, Rare returned to the spy genre with Perfect Dark in 2000. Swapping MI6 for the fictional Carrington Institute, Perfect Dark saw the incorporation of science-fiction elements, as well as the arrival of a brand new special agent named Joanna Dark. She’s the one who’s responsible for uncovering a shady conspiracy between the powerful corporation known as dataDyne and an ancient alien race called the Skedar. Combining first-person exploration, stealth, and exciting gunplay, Perfect Dark is an outstanding title that’s full of bold ideas. Clearly inspired by 1960s media like the British TV series The Avengers and the early James Bond films, The Operative: No One Lives Forever is a first-rate tribute to the genre and isn’t afraid to poke fun at some of its sillier aspects. Retaining the wit and colour of its influences, it conjures up some satisfying weapons and a clever plot that’s as much about discrimination in the workplace as it is about international espionage. At present, the game is currently unavailable through popular services like GOG.com, Humble, and Steam, because of disputes over the intellectual property. Considering how much fun Agent Cate Archer’s adventures were to play through, it’s a shame that it isn’t more widely available. Most spy games tend to position you on the Western side of the Cold War. Cryo Interactive’s point-and-click adventure, on the other hand, deals directly with the Soviet Union, putting you in the role of an agent in the last days of the USSR. Investigating possible corruption inside of the KGB, you navigate an interesting and volatile cast of characters while doing your job. Well-written and extremely difficult – the game is reminiscent of a great John Le Carré spy novel. A game full of rats, in more ways than one. Following a coup by the royal spymaster Hiram Burrows, the empress of Dunwall Jessamine Kaldwin is murdered and her daughter Emily kidnapped. Aided by a group of loyalists, the only person who can bring Emily back to the throne and punish those that seized power from her is Corvo Attano, the former bodyguard of the royal family. It may not be the first game you think of when you call to mind spy games, primarily because of its faux-Victorian setting. Nevertheless, Corvo performs several activities that are frequently associated with being a spy, such as assassinations, interrogations, and surveillance. It’s genuine shame there hasn’t been a new Splinter Cell game for a few years now. The franchise remains one of the more satisfying spy series available and features some superb writing, as well as the tremendous voice work of the veteran actor Michael Ironside as Sam Fisher in many of the earlier titles. For this list, I’ve selected Splinter Cell: Chaos Theory to appear as I believe it represents the high point in the series. To back this up, look no further than the Bank and the Battery missions in the game that combine dark humour with a string of optional objectives that are actually worthwhile. With improved stealth mechanics over the first two Splinter Cell games and a detailed and fascinating story, the title truly deserves all the plaudits it receives.